I did 15 pullups, second most. One kid did 18! A perfect score (100 points) is 20. I could have done a few more, but inadvertently was pulling myself too high each time, making them a bit harder. Some guys didn’t know you can do it palms-in or out. I prefer out, personally. 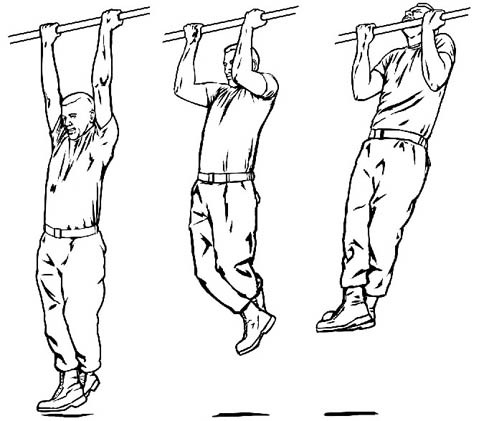 You have to get your chin to the bar, and I was getting my chest up, with my whole neck above the bar. It was a manly way to start the day, let me tell you–all 5 of us candidates were yelling and cheering on each guy to motivate whoever was doing the pullups at the time. After a minute to relax, the sergeant showed us how to do Marine Corps crunches. You can learn how to do them here: PFT Link. The staff sergeant said when he did them, he got 90 out of the 100 in his first 90 seconds. You get a full two minutes, and i’ve been working my abs alot so I wasn’t worried about scoring less than perfect. 19:39 three-mile run: 91 points. Did I achieve my goal? Read on!